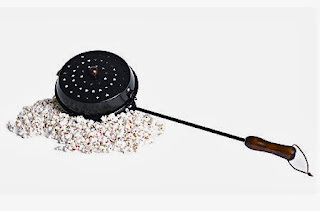 Our over-the-top gift idea starts with the purchase of a Rome Pioneer Popcorn Popper. Whats more fun for anyone who enjoys popcorn than cooking a batch over a campfire the way it was done back in the day. But a fire is not conveniently available so the Progressive International Microwave Popcorn Popper, is perfect while at work or staying in a hotel. These two items along with a jar of premium popcorn kernels will be at the heart of a large gift box. You’ll also need an assortment of cooking sprays, seasonings, herbs and spices. They will be used to create a series of homemade popcorn toppings that will be placed inside of this great gift basket idea. gift box. Theses sprays are typically sprayed directly onto the popcorn prior to the addition of the seasons. As for the seasonings, we have four homemade toppings that we’d like to share. Each one is made with dry ingredients. So they can be whipped up in advance and stored until your gift receiver is ready to use them. For starters, we’d recommend mixing red pepper flakes, garlic powder, parsley and nutritional yeast into one container. Together they make an amazing, Italian themed topping that also pairs well with pasta. Does your loved one like the taste of ranch too? Well then, why not create a ranch flavored topping? It may be made by blending dried dill, white pepper, powdered buttermilk and popcorn salt together. If your loved ones adore Spanish food, they may appreciate our homemade fiesta popcorn topping as well. It’s made with chili powder, cayenne powder, popcorn salt, lime zest granules and nutritional yeast. Lastly, you may want to toss in a jar of gomashio, it's a blend of sea salt and roasted, ground, unhulled sesame seeds. You can generally purchase it readymade or make your own blend at home with the aid of a spice grinder. Once you are finished making the homemade seasonings, add them to the gift box and present it to your beloved. For more gift ideas like these, check our gift idea category. We have a vast assortment of camping accessories in stock that would make excellent gifts or try our gift cards and certificates.